It’s hard to believe it, but the regular season has concluded, making this the final Predators Weekly for the 2018-19 season. Somehow, despite all the ups-and-downs, injuries and inconsistent play, the Predators managed to capture the Central Division crown. They went 3-0-0 in the final week to leapfrog the Winnipeg Jets and secure the title for the second straight season. They finished the season with a 47-29-6 record and 100 points, and will take on the Dallas Stars in the opening round of the 2019 Playoffs. There were several things that broke right for the Predators, which we’ll get to in a bit, but first, the week that was. The Predators opened the week with a road matchup against the Buffalo Sabres. Craig Smith opened the scoring 8:49 into the game. The Sabres tied it seven minutes later and the teams went into the second knotted at one. P.K. Subban didn’t waste any time regaining the lead with a beautiful solo effort to continue his great play in recent weeks. Unfortunately, the Sabres tied the game once again, this time with five seconds less in the second. The Predators ultimately walked away with a 3-2 victory thanks to Ryan Johansen’s game-winner. Two nights later, the Predators were in Nashville to host the Vancouver Canucks. The Predators had to claw back in this one after they gifted the Canucks a two-goal lead thanks to two first-period power-play goals. Colton Sissons cut the Canucks’ lead in half with a goal 37 seconds into the second period. The score remained that for the remainder of the second and the majority of the third despite the Predators dominating play. It took until the 15:40 mark of the third to tie the game thanks to a gritty Nick Bonino goal. It appeared the game was destined for overtime, however, Johansen had other plans, scoring the game-winner for the second straight game. This time only 21 seconds remained after his pass deflected off a Canucks player and into the net. 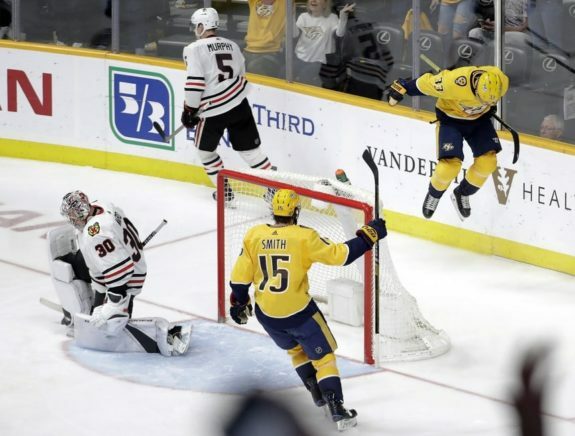 Another two nights later, the Predators were again at home, this time facing the Chicago Blackhawks to close out the season. At puck drop, there was potential for the Predators to finish anywhere from first through third in the division, but they did control their own destiny. Win and they were division champs. It was not an easy game, however, as the Blackhawks sought to play spoiler, and they nearly did. For the second straight game, the Predators were down 2-0 after the first period despite controlling play. Those were the only goals the Predators allowed in the game as they scored five unanswered goals. Dante Fabbro netted his first career NHL goal near the halfway mark of the second period and Filip Forsberg tied the game with his 28th of the season. In the third, Viktor Arvidsson netted a power-play goal, his 34th of the season, early in the third and Sissons and Bonino followed it up to give the Predators a 5-2 victory. 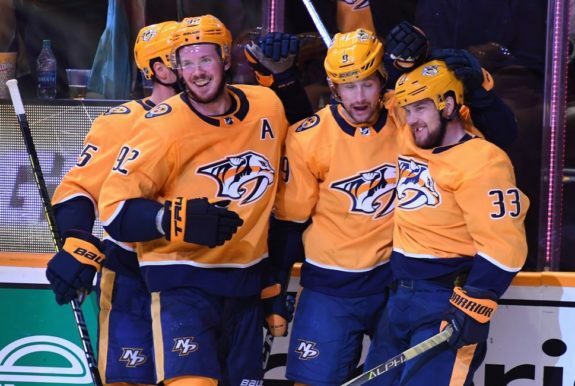 By game’s end, the Predators had ensured themselves a division title. Considering that the Predators entered this week following a 5-2 loss to the Columbus Blue Jackets on home ice, it seemed unlikely they’d do enough to win the division. Yet over the week, they played some of their best hockey of the season, and it all came together to win three straight games to gain home ice in the first two rounds. Let’s look at some of the aspects that came together at the perfect time. All season, the Predators’ second line has been a black hole as only Smith has lived up to expectations. Kevin Fiala was shipped out at the trade deadline for Mikael Granlund and Kyle Turris has struggled all season. It felt like no matter who played on the line, he couldn’t score. That changed over the last week as Granlund, Smith and Turris combined for four points. They also dominated play in all three games, with at least a 57 percent shot share in each. The biggest source of the Predators’ offense in the past three games was, unsurprisingly, the JOFA line of Johansen, Forsberg and Arvidsson. For the season, the trio controlled over 55 percent of all metrics and they represented 26 percent of the team’s offensive output. They scored three points over the last week, including all three game-winners. But the main reason the Predators went 3-0-0 last week was Pekka Rinne. The 2018 Vezina Trophy winner hasn’t had the greatest of seasons, with a 2.42 goals-against average (GAA) and a .918 save percentage (SV%). However, in the final three games, he had at least a .929 SV% in each, and generally held the fort until the offense got rolling. Given his past postseason struggles, finishing the regular season on a roll is a great sign. Despite only playing in 58 games, Arvidsson put together one of the best seasons in Predators history with 34 goals and 48 points. His 34 goals surpassed his previous career high by three and it was only the ninth time in franchise history that a player netted at least 30 goals in a season. But, not only that, his 34 goals also set a franchise record, besting the 33 goals scored by Forsberg in 2015-16 and Jason Arnott in 2008-09. Arvidsson’s .59 goals-per-game rate was also third-highest in the league this season after Alex Ovechkin and Leon Draisaitl. Had he stayed healthy all season, Arvidsson was on-pace to score 48 goals this season. He may have waited until the final game of the season, but him scoring the game-winner in a victory that clinched the Central Division capped off a remarkable season for the former fourth-round pick. The Predators signed forward Lukas Craggs and defenseman Brandon Fortunato this week. Both were undrafted college free agents. Austin Watson returned to the lineup against the Sabres for the first time since Jan. 23 following an alcohol abuse related suspension. He looked great in the three games, posting three assists.